The foregoing citation is part of a statement made by a civic organization which fought to get the dolphin known as Jedori returned to the sea. As the statement says, I decided to get Jedori returned to where he was caught, i.e. the sea off Jeju Island, about a year ago. Jedori is one of an endangered species, as only about 100 bottlenose dolphins live in the seas around Jeju. It is reported that the species may cease to exist by 2050. At present, Jedori is undergoing training to learn how to feed itself before being returned to the sea at the end of June. This initiative will mark a significant turning point in our efforts to protect the ecological system and increase the numbers of endangered species. Overseas observers will also applaud our efforts to preserve marine wildlife. Children and parents will understand our decision even if they are no longer able to see a dolphin show at the zoo. I believe that the relationship between animals and people should be reestablished on the basis of mutual respect. 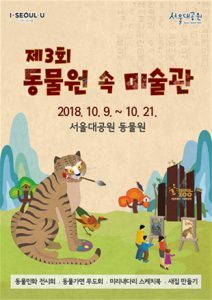 As Dame Jane Goodall has put it, “People can’t be happy while animals are unhappy.” On the occasion of its 30th anniversary, Seoul Grand Park will be reborn as a place that ‘heals’ humans, as a zoo where happy animals greet us warmly, as a new educational space for children, and as a center for animal reproduction and species preservation. Visitors to an exhibition held at Seoul Citizens’ Hall to bid goodbye to Jedori.